This Memorial Day weekend was spent in Austin, Texas preparing for and racing in the second leg of the Race to the Toyota Cup Series. This was also my first time to Austin, Texas and Nate and I both love the city. There are so many parks, natural springs and gravel trails to train around the city; not to mention great food! The race began early Monday morning with a one lap river swim, four lap bike and two lap run. Although it was a non draft race, it seemed almost like a “draft-legal” race with the multiple loops! Race morning was warm and muggy, so hydration was on my mind. I made sure to start off my morning with two bottles of First Endurance EFS with my PB and banana toast! I was not sure how my body was going to react this weekend having just gotten back to altitude a couple weeks prior and also “training” through the race with the exception of a few easy days leading up to the race. The goal of the race was to earn valuable series points. Once the gun went off in the swim, it was time to race and be focused! About 400 meters into the swim, we ran into the men!! Unfortunately, some of the men went off course which led to a co-ed swim. I was sure that we were swimming the correct course, although it does make you think to make sure what you are doing is correct. 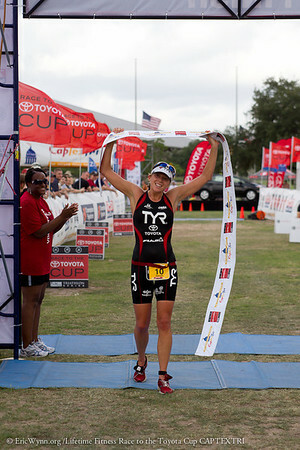 I exited the swim in second position, about ten seconds behind Sara McLarty. Once out on the bike, I wanted to push, but be sure to stay within my limits. Since this course was four laps and hilly, I knew being technically sound on the bike would be a key to success. Every lap, I became more confident in my cornering skills and also had to be aware of other cyclists on the course. On the third lap, the wind really picked up and I had to get out of aero position several times to make sure that I did not get thrown off the bike due to the cross winds. Thankfully, I had my Zipp404 verses my standard non draft Zipp808! I made sure to hydrate during the bike and drank two full bottles of EFS! I exited the bike with a 90 second lead and knew that I just had to keep a steady, strong run all the way to the finish. With the heat and humidity, I wanted to make sure I did not push too much too soon and not make it to the line. Although, it hurt, I focused on trying to keep my form together best I could. I was so glad to get to that finish line and break the tape. In racing you never know what can happen. I accomplished my goal, did not make any mistakes, and could not be happier to win my second Toyota Series race. I still have a long season ahead of me, but am going to continue to focus on one race at a time. Thank you to everyone for the ongoing support!! I hope you had a good Memorial day and had a chance to remember all those that have served our country. None of this would be possible without them.